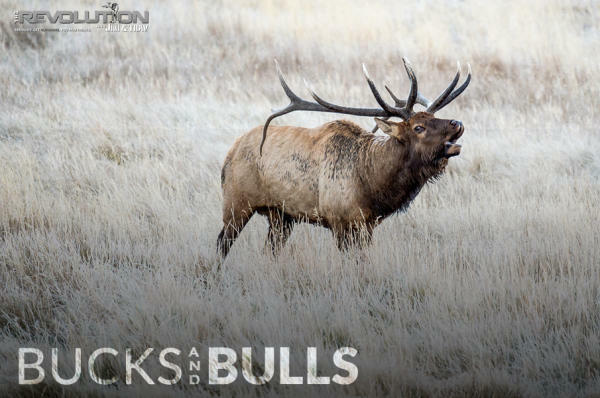 We’re hunting Bucks & Bulls so tune in to The Revolution with Jim and Trav this week as they zero in on how to hunt pre-rut elk, early season mule deer, whitetail and antelope. Joining us will be Jim Shockey, co-host of “Jim Shockey's Hunting Adventures”, Joe Kenney, owner operator of KOVE in Lander, Wyoming and David Blanton from “Realtree Outdoors”. Jim and Trav’s “Bucks & Bulls” broadcast is presented by Outdoor Channel, Sportsman Channel, World Fishing Network and MyOutdoorTV. Jim has an incredibly extensive collection on display at the Hand of Man Museum, like the tusks of a Mastodon found in the Yukon; the skeleton of an Alaska Yukon Moose – the largest moose species in the world; and a pristinely taxidermied Muskox – the fourth largest known to man. While everything there is interesting and has important historical value, he highlights some of the pieces that stand out the most to him, personally. One of those happens to be the moose rack from his father’s last hunt, a hunt they went on together which was featured on Jim Shockey’s Hunting Adventures on Outdoor Channel about 10 years ago. A bullet hole is visible through one tines of the moose rack, a missed shot the first time around before his dad made the lethal second shot. Jim says that by definition, “trophy” is a memory of an event or an accomplishment and items like his dad’s moose rack are real trophies for him – they bring back and elicit those memories. Jim says that there is nothing better or more important than that. Jim’s first whitetail, his children Branlin and Eva’s first whitetails, his father in law Len’s last whitetail – all on display at the museum, Jim says anything to do with family are the items he finds most important and valuable. Tours of the Hand of Man Museum are free and can be booked online at HandofManMuseum.com– if you happen to be in the area, be sure to make the trip, it will be well worth it! Jim Shockey is a man of many passions and that includes being actively involved in efforts that support both former and current military personnel. In fact, many people may not be aware that he is an active member of the Canadian Armed Forces, serving the rank of Honorary Lieutenant-Colonel (HLCol) of the 4th Canadian Ranger Patrol Group. Jim will highlight the therapeutic effect that the great outdoors can have on service members and their families and says when it comes to thanking them in a meaningful way, it’s hard to ever do enough. However, always seeking to do more for them, Jim is a part of an upcoming event with these service members in mind. December 2nd and 3rd in Myrtle Beach, South Carolina Jim will be hosting the first ever Jim Shockey Classic. Teaming up with theFreedom Hunters, a Colorado-based non-profit group dedicated to reuniting veterans and military families with the great outdoors, “The Jim Shockey Classic.” will be a two-day gathering honoring those who protect our freedoms, and aiding in providing USA and Canadian military personnel with once in a lifetime hunts. This event will include a Jim Shockey meet & greet, a military presentation, a fundraiser auction, a military tribute golf tournament on a private 18-hole facility and a post-golf awards BBQ banquet dinner. Jim says that he picked up the sport of golf at 40 years old after being skunked on the course and has been working on his game since. He likens golf to archery, requiring the same mental strength and patience required. Tune in to this fun and incredibly informative interview with hunter and conservationist, Jim Shockey. Be sure to catch episodes of “Jim Shockey’s Hunting Adventures” on Outdoor Channel Sundays at 8 p.m. ET. Every year, a unique sporting event celebrating both history and the antelope takes place. The Annual One Shot Antelope Hunt in Lander, Wyoming began in 1940. Each member of a three-man team has the assistance of a guide to help them locate antelope. From there, it is up to the individual to shoot and kill an antelope with just one shot. At the conclusion of the contest, the team with the most kills wins. Tune in as Joe Kenney, owner and General Manager of KOVE in Lander, Wyoming joins us to talk about the 78thAnnual One Shot Antelope Hunt, September 13th through the 16th. He’ll talk about the teams, rules, customs, and history of the hunt. He’ll also talk about the purpose of the hunt in promoting the ideals of good sportsmanship, game conservation and other things such as comradery, hunting ability and accuracy with a rifle. He’ll also highlight the Past Shooters Club and Water For Wildlife Foundation – both organizations were created as a result of this contest. Joe will detail how they have contributed to western wildlife with more than one-million dollars spent on water projects like the installation of 104 water wells in 11 western states. Tune in for a look at this unique contest that is steeped in history and tradition. FREE GIVEAWAY: Enter to win Hi Mountain Seasonings’ Beef Jerky. Winners will receive one bag in each flavor – Original, Mesquite, Hickory and Pepper. Hi Mountain’s beef jerky is made with 100% USDA beef in their facility in Riverton, Wyoming. Jerky is handcrafted in small batches ensuring their high standards—moist, tender, delicious beef jerky made with their four most popular blends. Enter to win, weekly, at www.jimandtrav.com.